Bitter cardamom (Yizhiren)-Alpinia oxyphylla Miq. Pharmaceutical Name: Fructus Alpiniae oxyphyllae. Botanical Name: Alpinia oxyphylla Miq. 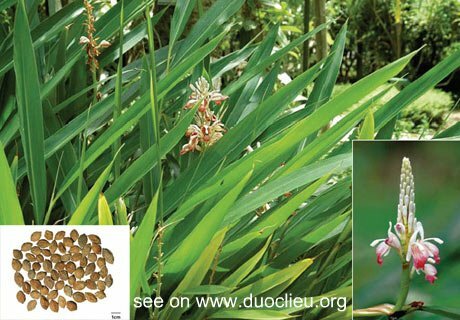 Common Name: Black cardamom, Bitter cardamom. Part Used & Method for Pharmaceutical Preparations: The fruit is gathered in summer. It is dried in the sun, fried with sand and peeled. 1. Invasion of cold in the spleen and kidneys manifested as abdominal pain and vomiting. Bitter cardamom (Yizhiren) is used with Pilose asiabell root (Dangshen), White atractylodes (Baizhu) and Dried ginger (Ganjiang). 2. Kidney deficiency manifested as enuresis and seminal emissions. Bitter cardamom (Yizhiren) is used with Dioscorea (Shanyao) and Lindera root (Wuyao) in the formula Suoquan Wan. 3. Diarrhea and excessive salivation due to spleen deficiency. Bitter cardamom (Yizhiren) is used with Poria (Fuling), Dioscorea (Shanyao), Pilose asiabell root (Dangshen) and Pinellia tuber (Banxia). Cautions & Contraindications: This herb is contraindicated in cases with deficiency of yin with excessive fire, seminal emissions, frequent urination and uterine bleeding caused by heat.